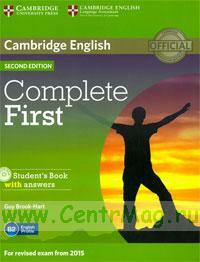 Complete First Second edition is an official preparation course for Cambridge English: First, also known as First Certificate in English (FCE). It combines the very best in contemporary classroom practice with first-hand knowledge of the challenges students face. The information, practice and advice contained in the course ensure that they are fully prepared for all parts of the test, with strategies and skills to maximise their score. Informed by Cambridge's unique searchable database of real exam candidates' answer papers, the Cambridge English Corpus, Complete First Second edition trains students to avoid common exam mistakes, guaranteeing teachers and students the most authoritative preparation for Cambridge English: First. • topic-based units, providing language input and practice for each part of the exam papers. • regular ‘Exam information' and 'Exam advice' boxes which explain the requirements of exam tasks. • Speaking and Writing references which focus on key skills required for the exam. • targeted vocabulary, drawing on research insights from English Profile, to focus on what students need to learn for the exam at B2-level. • all new Pronunciation sections to help students develop their speaking skills. • a CD-ROM with grammar and vocabulary exercises for motivating, flexible study. • complete Cambridge English: First practice tests online for teachers to access. MACMILLAN Exam skills for Russia: Practice Tests for the Russian State Exam. Сборник тестов для подготовки к ЕГЭ по английскому языку. Издание второе.